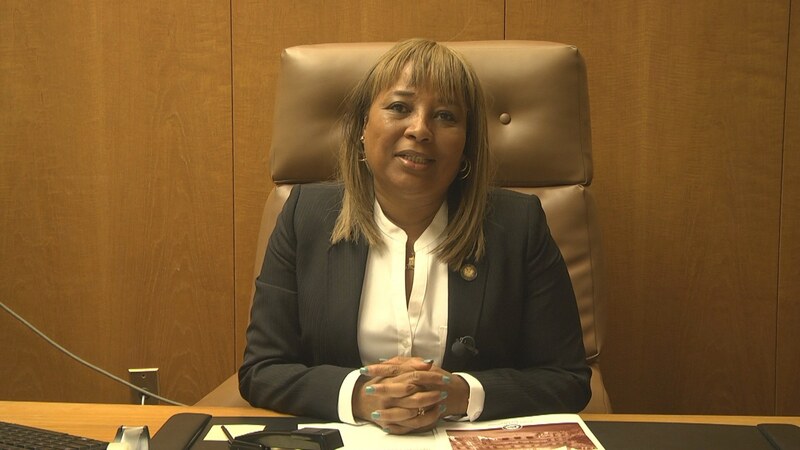 Pamela Harris, Assemblywoman representing the 46th Assembly District, has been indicted on 11 counts of multiple fraud schemes and obstructing justice. Charges include two counts of wire fraud, one count of conspiracy to commit wire fraud, four counts of making false statements, two counts of bankruptcy fraud, one count of witness tampering and one count of conspiracy to obstruct justice, the US Attorney’s Office confirmed. According to a statement by the US Attorney’s Office, Harris allegedly tampered with Federal Emergency Management Agency (FEMA) money, defrauding FEMA out of nearly $25,000. She claimed to the federal agency that she had been forced out of her Coney Island residence because of Hurricane Sandy’s damage. She had claimed that she moved to Staten Island. “In furtherance of the scheme, the defendant submitted to FEMA fake lease agreements that she had purportedly entered into with the landlord of the Staten Island residence, as well as bogus rent payment receipts,” the statement said. It turned out, Harris never moved to Staten Island. In fact, she lived in her Coney Island home and kept the FEMA money to herself. She was not an assemblywoman at the time. But in 2016 (when she was assemblywoman), Harris allegedly submitted the same false documents misrepresenting her need for financial assistance to the NYC Build it Back Program. She also persuaded the Program to pay for major construction in her home. She allegedly submitted a forged lease agreement to the Department of Youth and Community Development, while she was the executive director of a non-profit organization, Coney Island Generation Gap. As soon as her organization received funding, she diverted the money to her own checking account and used it for her own personal endeavors. She was not assemblywoman during this time (between August 2014 and July 2015). Between July 2015 and January 2017 (as assemblywoman), Harris allegedly defrauded the NYC Council by claiming that funds would be spent on rental space. Again, when her non-profit organization got the funding, she used $11,400 for her own personal use. This defrauding may be the same in the report published by the NY Post in July of 2016. The Post had claimed that Harris’ campaign allegedly inappropriately coordinated with the nonprofit she founded to help Coney Island youth. The Post also claimed that the nonprofit still operated from the Assemblywoman’s home, even though she had left the organization a year before. Nonprofits are prohibited from participating in a political campaign. At a 2016 conference in Kaiser Park that BKLYNER attended and reported on, she had said the nonprofit continues to operate from her Coney Island home out of necessity — affordable spaces in the area are hard to come by — but the organization is working to find a new location in a nearby public school. Harris also said the $26,000 spent by Coney Island Generation Gap for “occupancy, rent, utilities, and maintenance” was used to rent a room in her neighbor’s property for a video production studio and to pay for one-time events at other locations in the area. None of that money was spent to use the first floor of her home, she claimed at the time. She also said she never collected a salary from her nonprofit as an assemblywoman. Currently, Harris is also indicted in a bankruptcy fraud scheme. She filed for Chater 13 bankruptcy in November of 2013. Chapter 12 bankruptcy is usually from “debtors who want to keep secured assets, such as a home or car, when they have more equity in the secured assets than they can protect with their New York bankruptcy exemptions,” according to the NY Bankruptcy Law. But at the time of her filing, she was receiving $1,550 each month from FEMA. She told the Bankruptcy Trustee that she was instead receiving “$1,200 a month in financial assistance from the same landlord that she told FEMA she was paying $1,550 a month in rent.” Both were incorrect statements, the US Attorney’s Office said. Between March 2017 and May 2017, Harris realized she was under investigation because of her many schemes. She then allegedly proceeded to tell witnesses to lie to the grand jury and they did. If Harris is convicted, she will face “a maximum sentence of 30 years’ imprisonment on one of the charges relating to making false statements to FEMA; a maximum sentence of 20 years’ imprisonment on each of the wire fraud conspiracy, wire fraud, witness tampering, or obstruction of justice conspiracy charges; and a maximum sentence of five years of imprisonment on each of the bankruptcy fraud or other false statements charges, ” US Attorney’s Office states. “The allegations against Assemblywoman Harris are serious and troubling and are deeply disappointing, if true. As elected officials, any breach of the public trust is a serious offense and must be fully investigated,” Aaron Hecht, spokesperson for Council Member Mark Treyger, told BKLYNER. “We must take any case with charges of this nature seriously, just as we must respect the judicial process and our country’s basic legal principle of presumed innocence,” Stefan Ringel, communications director for Brooklyn Borough President Eric Adams, told BKLYNER. We have also reached out to Harris’ office and Congressman Hakeem Jeffries (who endorsed her in 2015). We will update once we hear back. Mean while I really did lose my car to hurricane Sandy, I was living in Sheepshead Bay at the time, I applied for help and got turned down but they were wanting to put me up in a hotel when my apartment didn’t get any damage from the bay surge.. SMH! Is this the record for shortest period of time between assuming office and indictment? It has been only 26 months.